So, I have been challenged to share a "no sugar" recipe each day of June. I am going to do my best to keep you stocked full of ideas. While it is summertime, this crockpot oats recipe is good to make ahead for the week, and doesn't heat up your whole kitchen. Let me point out a few things about the ingredients. 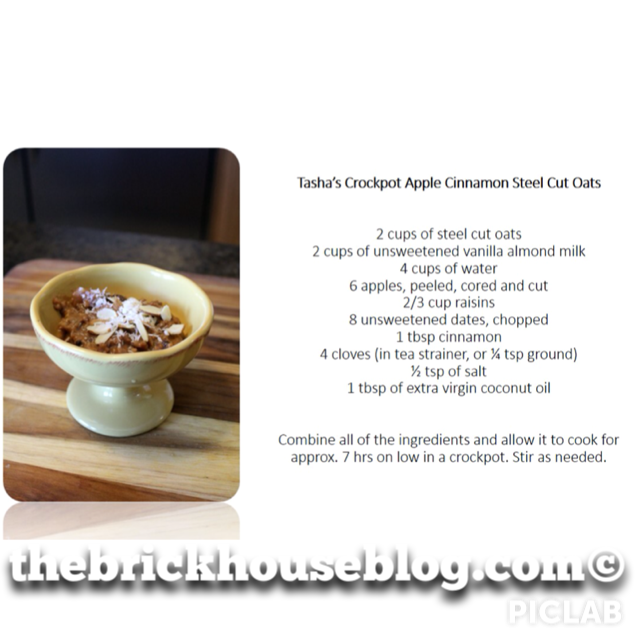 Steel cut oats are a more whole form of oats that are heartier and retain their shape better in cooking. They take longer to cook, but the result is a almost nutty texture. The best brand (or most widely recognized) is Bob's Red Mill Oats Steel Cut . I order them from Amazon, or Big Lots has been carrying them as well. Almond milk is all the rage, but many varieties contain sugar, especially the flavored ones. Silk brand unsweetened almond milk is the cleanest variety out there. You can use regular skim milk if you would like. Be sure that the raisins and dates that you choose are not coated in sugar, dextrose, or the like. Look at the ingredients and it should only read "raisins" and "dates". No brainer. When buying coconut oil, it is really important to choose extra virgin, cold pressed. It is the highest quality with the most nutrients available. The cheapest place that I have found it is Sam's Club. Just yesterday I made a different variety of this using ripe bananas, cinnamon, cloves, raisins and walnuts. It was like banana bread in a bowl. You will be so surprised at how the fruit can sweeten oatmeal without added sweetener. And you get the benefit of fiber, to boot! I have a canister of steel cut oats at eye level in the pantry that's been staring me down for several months. I just haven't found any inspiration...until now. Thanks for the recipe! I am going to make this this week will let you know.